The Great India Place Mall is one of the largest mall in the country having an immense range of international and national outlets with best-in class food courts and entertainment places. Spread Over 147 Acres of land and established with approximately 1 million sq. ft. of retail outlets which directly attracts an extreme number of 2 million footfalls every month. Gardens Galleria, The newest and Best uber-cool Space to Hangout in Noida. The Garden Galleria Mall is the Next Big thing ruling out the whole city, having the best hubs for entertainment, food, shopping, kid’s mania and much more making it the best place in the north area. 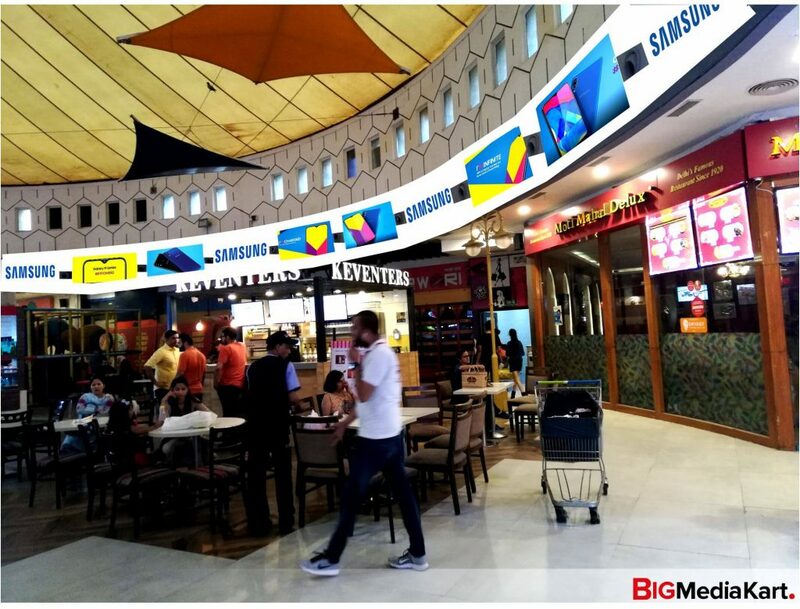 With the sparkling infrastructures and easy connectivity with the metro line & the famous Wave Noida Sector 18 Station, these malls attract vast number of visitors on daily basis making it a core element to must include in your brand advertising campaign covering Delhi, Noida & Gurugram (formerly known as Gurgaon). 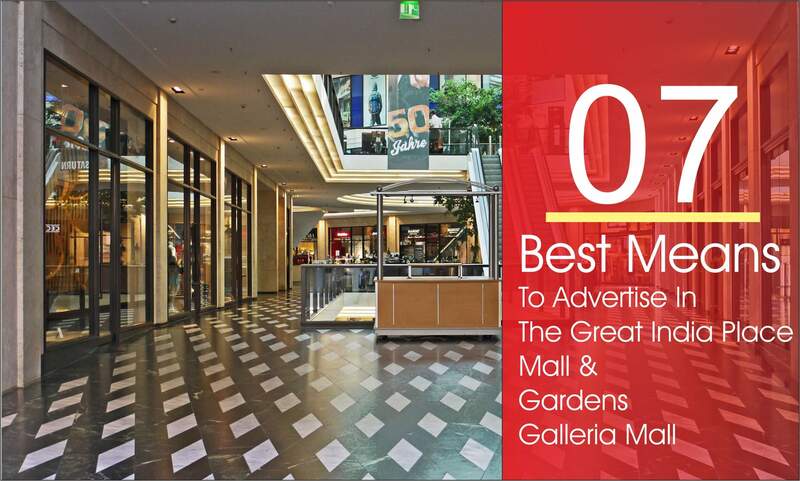 One of the most captious advantages to advertise and market your brand in The Great India Place Mall & Gardens Galleria Mall is that you get an extensive number of people to introduce your business products and make a positive impact about your business. People not only visit these malls to shop but also come over with friends & families to enjoy the food court and watch a movie. Hence, making it a great opportunity to start your brand advertising campaign. Now, it’s time to choose the right type of advertisement option best suitable for your ad campaign. 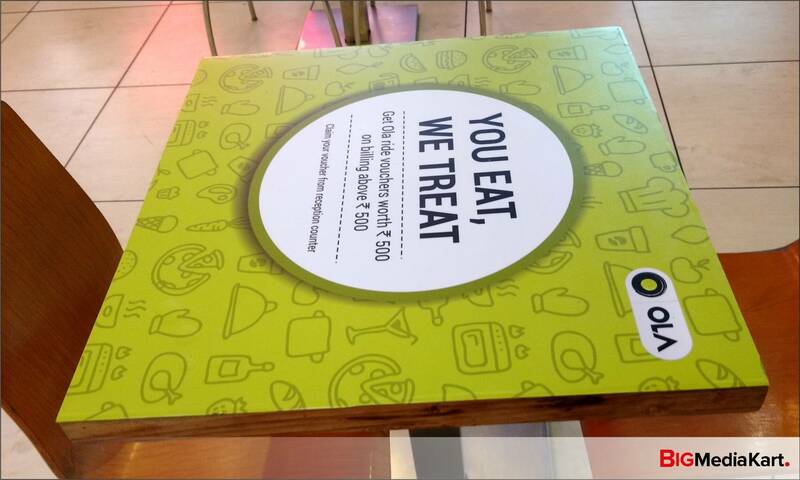 Food Court tables are the busiest 24×7 place where people sit, wait & crave to fulfill their hunger desires. In the due course, people dedicate at least one hour while having their meals, making them a perfect captive audience to be captured by the brand advertisement via the food court tables top stickers. Moreover, advertising with innovative brand designs on the food tables serve as a cherry on the cake and draw greater attention towards your brand. This results into Zero Ad Avoidance & huge brand recall creating an effective response for your ad campaign. 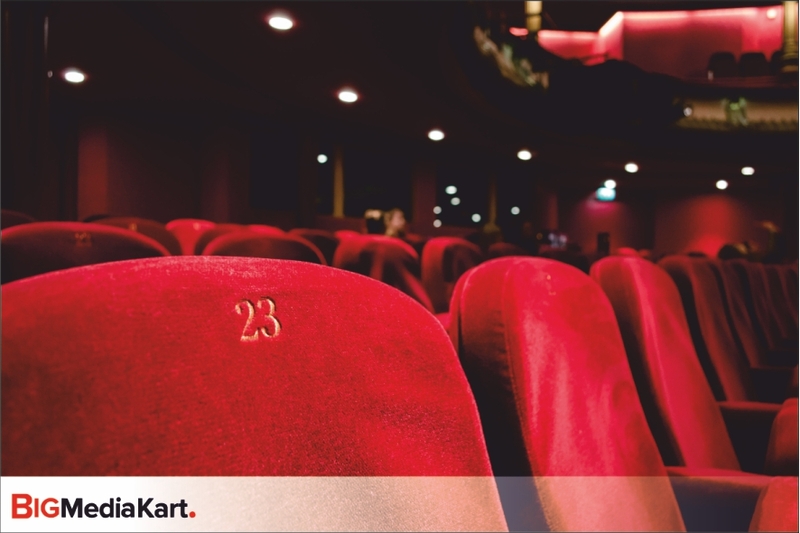 Cinema halls gather & entertain thousands of people at a single point of time. This very nature makes them a perfect advertising destination to setup your advertisement campaign. It is not only the huge number but movie in cinemas is also watched by different types of people from different backgrounds giving a perfect blend of TG (Target Group) for your advertising campaign. Carnival cinemas advertising in The Great India Place being flexible in nature gives you a control to select and best customize your advertising campaign tailor made to your requirements. 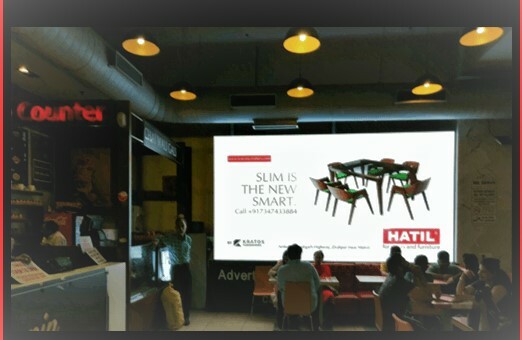 The most trending way to capture the audience in the malls is to advertise your brand on strategically located Grey Wall above the food outlets in GIP Mall Food Court which runs throughout the entire food court helps your brand capture 100% audience attention as soon as they enter the food court. Grey Wall Posters offer your brand’s advertisement 100% Strong Visibility, Zero Ad Avoidance, High Response Rate, Huge Brand Recall and Grand ROI. BIG LED Screens have become most successful to attract crowd making it a great opportunity to advertise & market your products directly to your targeted audience. Being top 10 biggest malls in India, the TGIP Malls’ food court attracts many hungry shopper’s whole day. Hence, making it a perfect destination for the businesses to advertise their brand and get noticed by the massive audience. Moreover, the captive nature of the huge crowd (dwell time of minimum 1 hour) visiting the food courts gives a strong Return On Investment(ROI) on your campaign with Zero Ad Avoidance. Stall Space Advertisement is your brand designated space where advertising of products or services can be arranged related to your brand. It is basically an equivalent of making a fresh site of your brand at a crowded place like food court, giving you an advantage to have one on one contact with your targeted customers.It is a simple, effective yet strategic method where you can convert your prospective leads into sales by simultaneously strengthening your Brand Equity. Advertising on wall never goes out of trend as walls wrapped with a strong creative of your brand impacts on people’s mind and while standing and waiting they get to interact with your brand and captivates attention towards the same. Pillar Branding Advertising is the perfect cost effective and eye-balls catcher advertising campaign for your brand. 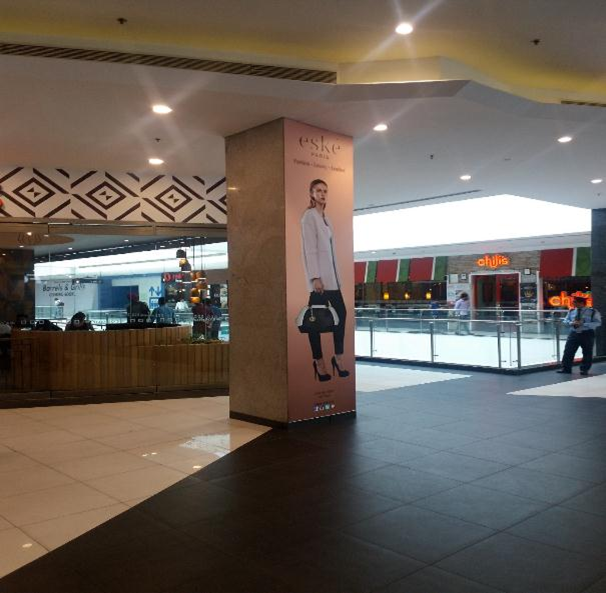 While waiting for the food to be prepared in the food court, the surrounding pillar branding ad will directly make an amazing impression to the people and will result in more brand engagements. 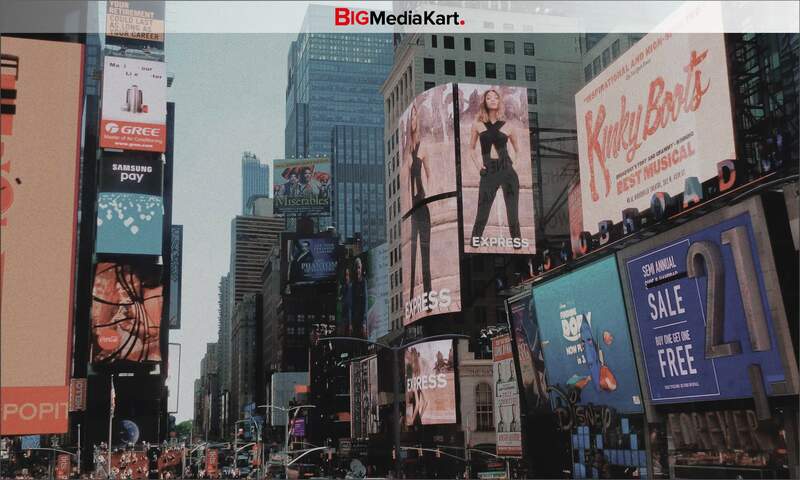 Planning for an effective mall advertising campaign, Big Media Kart , a leading advertising agency in Delhi NCR helps your brand, plan & book affordable advertising campaigns in The Great India Place Mall(GIP) & Gardens Galleria Mall.